Locked My Keys In The Car: Locking your keys in your vehicle on accident is a common mistake that many individuals make. This can happen because of several reasons and the main one being distraction. Depending on the situation you are in, locking your keys in the car may be dangerous, especially if you are alone or it is an unusual time to be out. Don’t panic- this is where you call our auto locksmith Portland specialists at Locksmith Monkey for help. With the assistance of our automotive locksmith services, we can get your keys out in no time. The best part about Locksmith Monkey is that our services are 24/7. At any given time of day, you can call our team for help without hesitation. Some locksmiths can only help you if you have a specific model vehicle, but our specialists can get your keys out of any car. Whether your car requires a key to unlock, a push button, or a keyless touch unlock, we can assist with all of these. Duplicate car key cut, door & ignition key reproduction, lost car key replacements, Laser cut key, transponder key, remote keys, break-in repairs, opening trunks & much more! Locked My Keys In The Car. Our main goal is to arrive to our clients within fifteen minutes of their call. We have an extremely fast response time, because we always put our clients first. We will immediately send someone to service you as soon as we can, to ensure your complete satisfaction. Our quick arrival will have you feeling stress-free, as you know you are in great hands with our specialists. 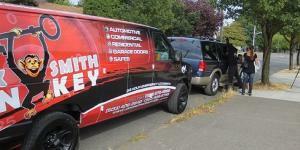 For any automotive locksmith services you may need, give our auto locksmith Portland specialists a call today at any time to schedule an onsite meeting!